A big thanks goes to Sharon Johnson for of her great box tutorial. Because of her details I have now have made my very first box. She gave excellent instructions on how to make different boxes. I followed her directions and I loved how it all came together. I hope soon to make the other boxes. A few days ago, I made a card for my new Great-Grandson Dylan and I designed this box to match it. Yesterday I purchased some Onesies shirts and my plans are to stamp some of them to put in this box for a small gift to go along with the other things I will be purchasing. Please read Sharon's tutorial for all the details. She does such a great job describing each step and she also shows pictures as she goes along. Thank you Sharon! I cut the giraffe with my Cricut using the New Arrival Cartridge and the Alphalicious Cartridge. The white polka dotted bow is from May Arts and the paper is from American Crafts. I am showing both the box and the card below so you can see how nice they look together. Joan, this box and your card are JUST STUNNING!!! WOW!!! Such cute paper -- I am IMPRESSED!!!! So, so adorable! 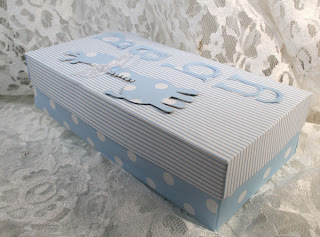 Just love this Joan, a fabulous, fabulous baby box! Joan these are fabulous!! Great job and aren't those boxes fun to make~!~! Pretty card and box! Love the paper.